The recordings on cambl.com are more recent and therefore of higher quality, and they are neatly listed and identified by psalm and tune. I have added those psalms to the list in this post. Recordings from the Scottish Metrical Psalter (1650). These recordings are all sung a cappella, and are free to download. For more recordings, and for more information about the people who made these recordings, click here. In order from left to right, we have: the psalm, the tune, and the people/group singing. Click on the psalm to be taken to the hosting site where you can listen and/or download the recording. I've put an "R" next to the tunes that repeat a line, since I know that not everyone appreciates those (as my brother says, "If that line was meant to be repeated, it would be repeated in the Bible."). The quality of these may vary. Where there are multiple recordings per psalm or section of a psalm, I've tried to pick out my favorites to include in the playlist I listen to regularly. The recordings in my playlist are marked with an asterisk *. I enjoy listening to recordings of psalm singing. Some time ago, I began a quest to hunt down all the psalm recordings available online. I was looking for recordings a) from the Scottish Metrical Psalter of 1650, b) unaccompanied by musical instruments, and c) free to download. I've compiled a list of everything I could find that met my criteria, and thought I would share it with y'all. 1. Santa Fe--as you probably know, Jesh and I have been hosting occasional psalm singing gatherings, attended mostly by people from the Free Presbyterian Church of Scotland in Santa Fe, plus occasional guests. We currently have these recordings hosted on archive.org; the list is here. 2. CCRPC--Christ Covenant Reformed Presbyterian Church (RPCGA) in Wylie, Texas. This church uses the Comprehensive Psalter, which has the same text as the 1650 Psalter, but divided into selections with assigned tunes. Their recordings are posted here. They are singing straight through the psalter, and posting new recordings monthly. 3. Free Church--the Free Church of Scotland has a few psalm recordings on their website, but many of them are from their modernized psalter, not the 1650. They also have some Gaelic recordings. Another list of Free Church recordings can be found here, but most of those are duplicates from the Free Church site; the only one I got from that site was Psalm 130. 4. Highland Harmony Singers--a group of singers in Scotland who aim to promote psalm singing. I got their recordings from the website www.psalm-singing.org. --Any recordings that have the singers identified as "unknown" or something similar are also from the www.psalm-singing.org site. 5. Aberdeen FCC--found on the website of the Aberdeen Free Church of Scotland Continuing. This page has a very useful list of audio files of psalm tunes; scroll down to the very bottom for sixteen very nice recordings of psalm singing. And this page has two "sample tracks." 6. Niallags--these are psalms sung and recorded by Niall Maclennan and posted in this set on Soundcloud. 7. Connor Q--Connor Quigley has posted a number of psalm recordings on Soundcloud. Many of these are from the Scottish Psalter; you can listen to them here. Direct links are in the lists above. 8. EPC youth--The Brisbane youth group of the EPC (Evangelical Presbyterian Church, Australia) have recorded an album of psalms from the Scottish Psalter. You can listen to the recordings on Soundcloud here. If you know of other recordings that are a) from the 1650 Scottish Psalter, b) unaccompanied by instruments and c) free to download, please let me know and I'll add them to the list. Recordings from the Scottish Metrical Psalter (1650). These recordings are sung a capella, and are free to download. For more recordings, and to learn more about the people behind these recordings, click here. Psalm recordings from the Scottish Metrical Psalter (1650). These recordings are all sung a cappella, and are free to download. For more recordings, and more information about the people behind these recordings, click here. Links to recordings from the Scottish Metrical Psalter (1650). These recordings are all sung a cappella and are free to download. For more psalms, and more information about the people behind these recordings, click here. Here is a list of psalm recordings from the first book of the psalms, i.e. psalms 1-41. These recordings are all from the Scottish Metrical Psalter of 1650, are sung a cappella, and are free to download. For more recordings, and for more information about the people who created these recordings, click here. *In this recording, conference attendees are singing Psalm 27A from the Book of Psalms for Singing, but the text is the same as in the 1650 Scottish Psalter. As the weather begins to cool slightly, Texans are coming out of hibernation. We've been spending more time outside, and we're not alone; when we go downtown on Saturdays, we find that the parks and jogging trails are beginning to fill up again (and parking spaces are harder to come by). One recent Saturday, when I went to pick up the boys, I found them (and their dad, of course) at the Miller Outdoor Theatre watching Bach's Brandenburg Concerto, played with period instruments. We love the free performances at the Miller Theater, at least when they play classical. The evenings are the best time to get out for a bike ride. A few months ago, when the ex gave us this bike, I thought, "Oh dear, I'm not looking forward to teaching Elijah how to ride this." But I needn't have worried; he taught himself within about fifteen minutes. Noah's tricycle was a birthday present from Uncle Caleb and Aunt Leah. I highly recommend these old-fashioned metal Radio Flyer trikes. They are nice and sturdy, and big enough that they will last a child a long time. It's funny, my boys are almost two and a half years apart, but people are always asking me "Are they twins?" I guess it's because Noah is so tall for his age. They are close enough to the same size that they are able to share most of their clothes. September 11, 2001. I was a student at Indiana University. When I walked into my astronomy class that morning, I was a few minutes late, and the lecture was underway. My astronomy class was held in one of those big lecture halls in Swain East, with the seats sloping steeply down from the back of the room, and a huge projection screen on the front wall. As I took my seat, I saw a hastily handwritten notice projected onto the screen: "The Dean of Students has announced that classes will continue today as usual." Well, why wouldn't they? I wondered to myself. During the rest of class, I speculated as to what could have prompted such an announcement. I concluded that someone must have died, perhaps the president of IU, or Bobby Knight. At the end of class, as everyone stood up and started collecting books and papers, one of the associate instructors plugged something in and a movie started to play on the front wall. In the movie, skyscrapers were collapsing in slow motion in huge billowing clouds of flames and smoke. That's impressive, I thought, but why are they playing a movie, here, now? I grabbed the first passing student. "What's going on?" I asked. "What's that?" I gestured towards the screen at the front of the room. "We've been attacked. 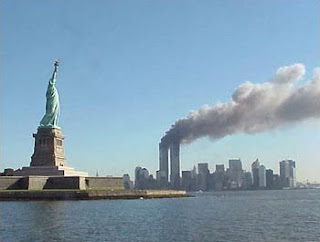 Some terrorists hijacked some planes and crashed them into the World Trade Center," he told me, shakily. I looked back at the screen in shock. (Just imagine, if you will, that the first time you heard about 9/11 was as you watched it happen in an IMAX theater. That's how it felt.) As I watched in horror, an airplane plunged into the side of a tower, then again, from another angle. I felt a little dizzy (dizziness enhanced by the steep slope of the room). It couldn't be real. I left and walked around campus feeling disoriented. The campus was strangely empty and quiet. In the common areas on campus, usually packed with students studying, eating, or napping on the couches, there were only a few people, huddled around TVs on black carts that someone had wheeled out of storage, watching the news channels replaying the same horrifying video clips over and over again. Ironically, it was a beautiful fall day, crisp and cool, the sun shining brilliantly. Most of the people I saw looked dazed. Some were crying. That afternoon I talked to my friend, an international student from Bangladesh. He was holed up in his room at his fraternity and frantically trying to reach a relative who worked in the twin towers [she turned out to be okay]. He mentioned matter-of-factly that he and other Desi friends would have to stay out of sight for a while. I didn't get it. "Why?" I asked. "Why do you think?" he replied. "I mean, hello, look at me. Brown skin? Black hair?" I thought he was being paranoid. Surely no one would be so stupid as to assume, based on his appearance, that his sympathies lay with the terrorists. Needless to say, I was being naive. He told me about a Pakistani friend who wore a headscarf. She had been harassed and threatened by a group of men who had shouted, among other things, "Go home." As I think back over the days and months surrounding 9/11, one thing that stands out in my mind is how Americans came together after the tragedy. I was really moved to read about how people lined up for blocks to donate blood, and how people from around the country volunteered to help in any way they could. I felt that we were united in grieving 9/11. I even felt (briefly) united with and proud of President Bush. In this day and age, I think it's easy to feel that you have little in common with the people around you (and I'm sure we could discuss for ages why that's so) but after 9/11, for a short while, we were all Americans together. Soooo...tell me your story. Where were you on 9/11? What stands out in your mind as you remember that day and the weeks around it? While I'm linking, here is Cath's brief history of the FP church. Edit: I'm tagging this post with "homeschooling" since that's the direction the comment discussion has taken. On Saturday we had another psalm sing. After lunch, we reviewed the two tunes we learned at our last psalm sing; so we sang Psalm 6 to Soldau, and Psalm 113 to St. Etheldreda. Then we sang Psalm 1 to Tallis. I won't post the ones we reviewed, as they sound pretty much like the recordings from last time; but here is Psalm 1 to Tallis. You can hear little Carl singing along in this recording. He's not even two years old yet (right? ), but he knows Psalm 1 and can carry a tune. :) I'm hoping that we can do Psalm 1 again some time when more children are here; it's so nice to hear children singing the Psalms. Phil 4:8 Finally brethren, whatsoever things are true, whatsoever things are honest, whatsoever things are just, whatsoever things are pure, whatsoever things are lovely, whatsoever things are of good report; if there be any virtue, and if there be any praise, think on these things.